Your application has submitted successfully! 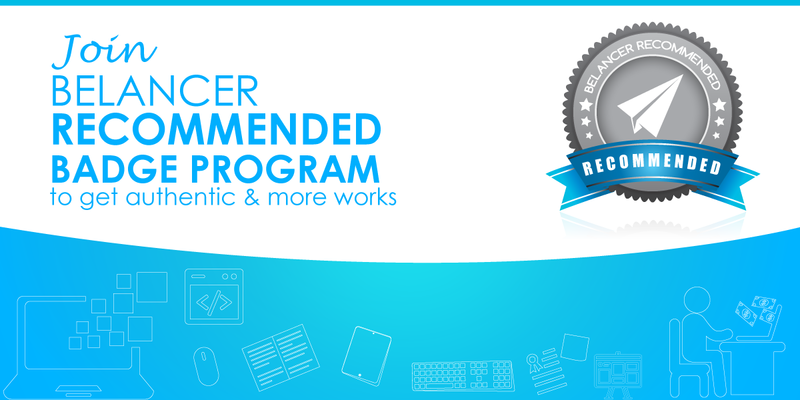 Belancer Recommended Badge Program provides freelancers extra marks for getting more freelancing jobs. This badge indicates you to the employers that you have the skills and potentiality to complete successfully the jobs. To get Belancer Recommended Badge applicants should follow some easy instructions. An attractive recommended badge will be viewed on your profile to help you stand out to clients in the marketplace. Belancer will ensure you verified employers. Inclusion in a premium talent pool from which top clients can easily find you to give a job. Belancer will assure you for the safe and secure payment for your every deals through escrow service. Belancer will offer you to build up long term career with Belancer. Priority Customer Support is given to you from Belancer. There will be an exclusive pass in Belancer’s Upcoming Events. Account has to be verified by Belancer. Complete your projects on time and as promised. What is your Professional work type? How many projects you have completed? I agree with Belancer recommendation policy. Belancer will assure you for the safe and secure payment for your every deal through escrow service. To Select your criteria you need to know about your working experience. Once Team Belancer review your application form, if all the criteria fulfilled, you will be nominated for the recommended badge. Belancer will send you an email. Beside this you can see your profile decorated with an attractive badge. Fill up correctly and give all your information on the registration form. Mension your skills, quality and other expertise area. Submit your profile links of other online freelancing marketing. Can I lose my recommended badge? Yes, you must maintain your user account in good standing and continue it in a regular basis. If you do not login your account for more than 1 month. Belancer Authority has full right to remove / cancel your recommendation badge if any mislead , misrepresentation or fraudulent occurs. How many recommended badges will be offered? There are no limit for providing Recommended Badges. Each individual will receive one badge if he selected by Belancer. I am new in freelancing work, can I get any recommended badge? Yes, you can get recommended badge though you are new in online marketplace. Provide all information regarding skills, qualities and expertise areas. If your skills and experiences fulfills the badge program criteria You will be notified.